Guiney’s of Talbot Street | Come Here To Me! « Me Jewel and Darlin’ Dublin. And so another Dublin institution comes to pass. No visit to Dublin by any man or woman over the age of 60 was complete without one of two things. A trip into Bewley’s on Grafton Street, this itself in danger only a couple of years ago, or nipping in to Guiney’s on the way back down Talbot Street to Connolly Station. Socks and jocks, towels, blankets and bed sheets; if you had them, chances are, the majority of them came from Guiney’s. The phrase “you’d find anything in there from a needle to an anchor” was once used by my mother to describe the place and she wasn’t far off and I’m pretty sure the signs outside constantly proclaiming a permanent “sale” broke some broke some law of commerce or another, but the shop was constantly packed with old women, who viewed the trip to Guiney’s as some sort of social occasion, rather than an opportunity to pick up a few bits and bobs. At approximately 17:30 on the 17th May, 1974, fourteen people lost their lives on Talbot Street, victims of the second of three explosions in Dublin that would later become known as the Dublin and Monaghan bombings. Thirteen of the victims were women, a number of them found on the pavement outside Guiney’s itself. Not this Guiney’s, the other one! Clery’s around the corner has been saved, and with that, 350 jobs and the phrase “I’ll meet you under Clery’s Clock.” Owned by the Guiney family for over seventy years, it has now passed into American ownership. 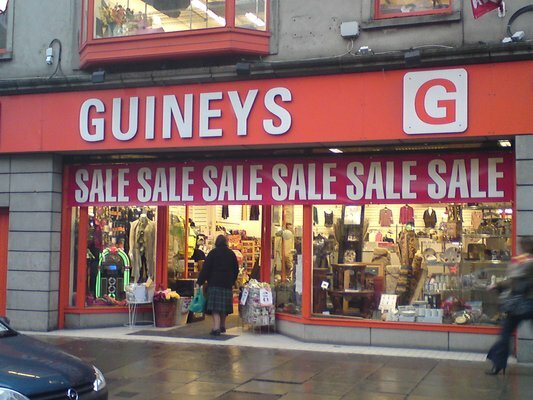 Sister store Guiney’s Home ware’s and their thirty staff aren’t so lucky though and another Dublin institution is set to disappear. Jayyyyysus. Where will all the culchies go for their continental quilts and duvets now, eh? I think this link explains the confusion over which Guineys is closing. Got all my Confirmation outfit there in June 1972. Absolutely every stitch except the shoes. Then up to Dolphins Discs to get ‘Metal Guru’/T. Rex as a treat. Went inside in 2008 when I was back visiting Dublin after a long absence and not much had changed. I was surprised it was still open. I presume they are all part of the same business though? Correct me if I’m wrong… The Guiney’s referred to re. The Dublin/ Monaghan bombings is the one close to the corner of Gardiner Street, the other on North Earl St. Anyone? Same family but different businesses according to Pat Kenny this morning. Micheal Guiney businesses still open. Denis Guiney business closed. The one closed is as you say corner of Talbot St./Gardiner St and it was the one nearest the car bomb. Not sure if the car was parked right outside or across the street but the shop front took the blast judging by the damage in photos. We went on a school trip to Limerick that day and were back in Dublin by 7pm and the city centre was deserted and cordoned off, horrible atmosphere as I remember. Article title corrected accordingly, cheers folks!